teasing them out this was the tonic I'd need since that Wednesday. It felt so good to be just there with no demands, no expectations, no need other then my own being turned and tossed by printed page and two black makers. Two pages later I paused. Reclaiming my scalpel from my husbands tool box I returned to my design desk where I like to paint, play and create I cut with a ruler one of the pages into strips - this destruction and reconstruction seems to be a thing in my process now... 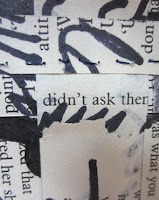 I took the other page and cut precise marks in the page. 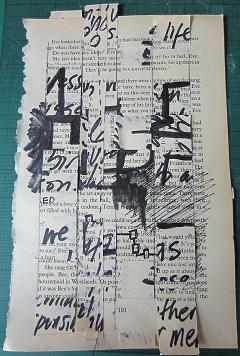 The scalpel its blade blunt snagged on the soft fawn brown old printed page. 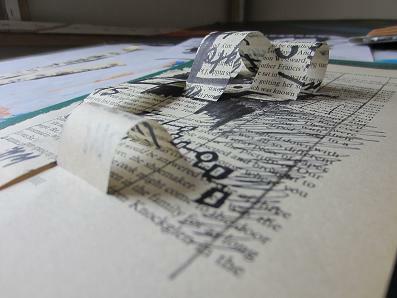 The paper folded in tiny mounds like an accordion of unwanted noise. I replaced the blade wanting crisp sharp cuts in a regular pattern. I looked at the strips of paper working in silence. Letting my absorbed attention be. Funny how splicing up paper, writing and using makers, cutting, folding, weaving and stitching two torn leaves from that book seems to have appeased my soul turned off my brain off and allowed me to switch gears and ungrey my humour. Last weekend it was out in the garden that's what my soul demanded then. Saturdays seem to be about nurturing and caring for my soul which has been ravaged recently by family illnesses and bad news. Outdoors and alone is where I tend to my soul. Unfortunately my lifestyle doesn't permit too much of a creative lifestyle (and if I'm honest I usually end up more frustrated!) but nature always has a way of putting me to rights. Love picture of a sulking soul... had never quite thought of it in that way before. Thanks for the thoughtful comment Dee - I think gardening is very creative don't under estimate the work you do in community gardens or tending your own garden & the photos & blogging I think that is all creative too. I hear you though being out doors - the alone piece is an interesting one - we both work with people so yup the alone time resonates with me too.